Home Bandra Colaba Dadar Dharavi Fashion Street Indian Fashion Blogger Lifestyle Matunga Mumbai Mumbai Darshan Mumbai Fashion Blogger Mumbai Street Shopping Priya Adivarekar Shopping Street Shopping Travel When in Mumbai, take a day out to shop! When in Mumbai, take a day out to shop! Summer vacations have started and I can see a zillion families who have come to Mumbai for a holiday. When I go somewhere, I make a list of places to see and most importantly, I always jot down a list of must buy items in my diary. After all, every city/village or country have markets which sell traditional items, be it food items, accessories or apparel. Even if it's not traditional, I make sure I pick up something as a souvenir. Like during my last trip to Konkan, I picked up tons of wooden toys and accessories from Sawantwadi. When people visit Mumbai, they want to visit the Gateway of India, take a horse ride outside Taj Mahal palace and towers and pray before the beautiful Siddhivinayak idol in Prabhadevi. But, do they have a shopping trip in mind too? If yes, then this list will help you to decide which place you should head to for some good, really cheap items. Bandra (Hill Road) – We start with the Suburbs and what better than the most loved market place, Bandra. There are two popular street side shopping destinations - Hill road and Linking road. I’ve been buying chunky jewellery and plain ganjees from Hill Road since ages. They have some good, affordable items. Plus, if you are good at bargaining like me, you will always get good discounts. Get down near the new Marks & Spencer mall (erstwhile Globus mall) signal and walk all the way till the St. Stanislaus High School junction. You will find street shops selling everything, from hair accessories to t-shirts, shorts and footwear. PS: Don't forget to visit the popular Mount Mary Church, which is 10 mins away from the St.Stanislaus signal. National College has tons of shops that sell chappals in all shapes, sizes and colours. You can buy Osho's, Ballet flats, Mojris etc. Also, you will find street side shops that sell bags and t-shirts for cheap. 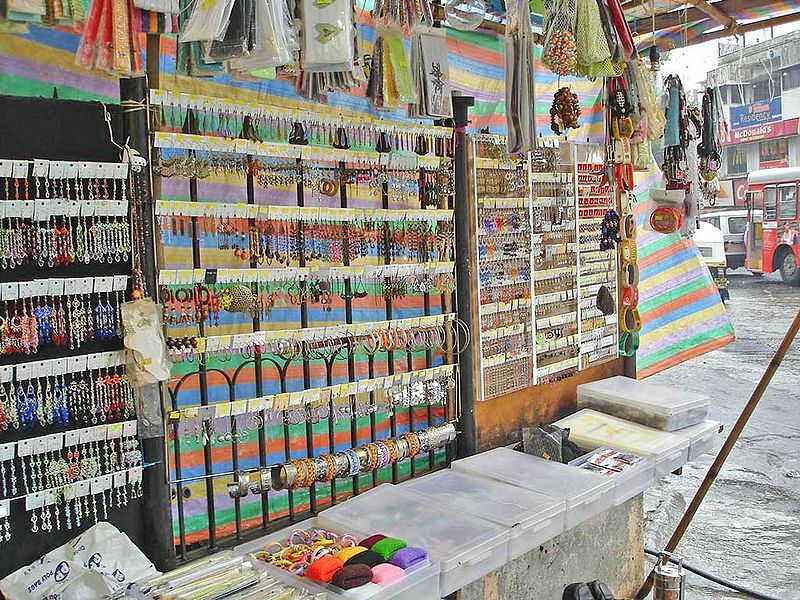 Get down near the National College signal to get some real, street shopping experience. Colaba Causeway – From suburbs, we move towards SoBo (SoMu or the town side, if you like it that way). After having a gala time at the Gateway of India, take some time out to shop. Colaba Causeway has got to be on every Mumbaikar’s list, so I don't see a reason why you must miss out on this! I don’t shop here on a regular basis, but you can find some amazing jewelry, bags, scarves and jholas. Although shopkeepers here don’t bargain that much (they way they do in Bandra), but you MUST give it a try. You might go crazy after you find some amazing pair of earrings and funky bracelets, but keep calm and bargain on! Crawford Market - Another popular shopping destination in SoBo, you will find travel bags and school bags at good discount. Pick up some healthy fruits from the market, especially mangoes. Visit Beauty Centre if you are looking at stocking up on some beauty favourites and then, walk towards Lohar Chawl to buy lights, lamps or knick knacks. 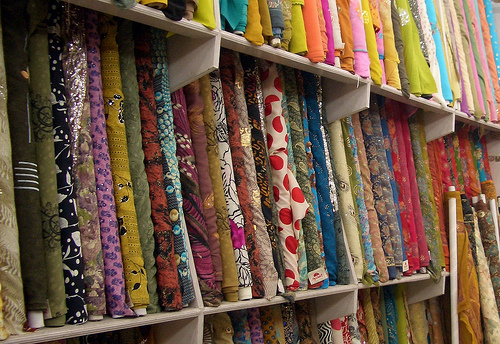 Also, check out the amazing variety of fabrics and ready made garments available at Mangaldas market nearby. For the hungry soul, a stop over at Badshah for their amazing Kulfi and Falooda is a must. Fashion Street - Located in the heart of Churchgate, this is another favorite with college students and shopaholics. From thrifted jackets to graphic tees and even fancy footwear, these guys stock up on everything. With an entire stretch, starting from the Old VSNL building to Metro cinema, dedicated to apparel and accessory stalls; you have a lot to choose from. Don't forget to bargain! There are a few stalls that have got labels like Asos, Topman and even H&M. You just need a little bit of patience and luck. 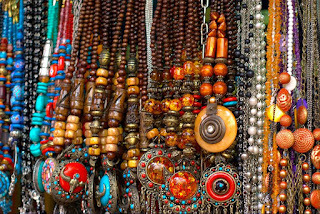 Dadar Market (Station road) – Love buying knick knacks? Want to stock up on some essentials like safety pins and hair pins? Dadar market is the place for you! 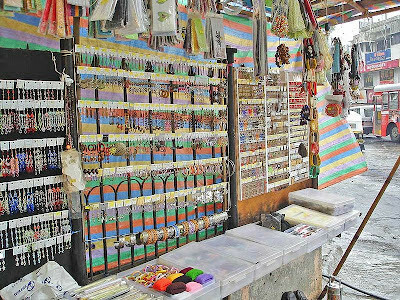 You can buy fake traditional jewelry for cheap from small shops. You will love shopping for Sarees as this place is famous for saree stores (Dadar east and west). Choose from high end stores where you can buy sarees for festivals or head to the station road for stores that sell cheaper sarees for daily wear. Dadar market is famous for flowers, masala (spices), yummy Maharashtrian food and more! So take a day out to sample everything and take some home. Gandhi Market – Situated near Shanmukhananda Hall, (Central south Mumbai, King's circle) this place is filled with shops that sell dress materials. They have dress materials that fits everyone’s budget! They also have shops that sell saree bags, jewelry boxes and hair extensions. You can also buy laces, buttons etc for DIY’s. They also have small shops that sell knick knacks for cheap. Hind Mata Market (Parel) – This one is a dress material haven! Also, those who like to experiment with different materials on their dresses, saree blouse and love adding some bling, this is the place for you. You will find tons of shops that sell different materials like PVC, Tikli, and Satin etc. Also, you can use these materials for DIY’s. Dharavi - Women love bags! I am sure the women of your family won't live in peace till they buy some bags from here! They have around 50 stores that sell leather and faux leather items including bags, jackets, briefcases etc. The prices range from cheap to slightly expensive, but the items they sell are really good. Plus, you have so many shops to choose from. Well, you can break your shopping trip into three days if you want to shop at ease! Cover SoBo (Colaba and Crawford market) when you visit Gateway of India, Haji Ali etc. Next day when you visit Mount Mary church, ISKON temple etc, shop at linking road, hill road and Dharavi. Lastly, when you visit Siddhivinayak Temple, head to Dadar market, Hindmata and Gandhi Market. 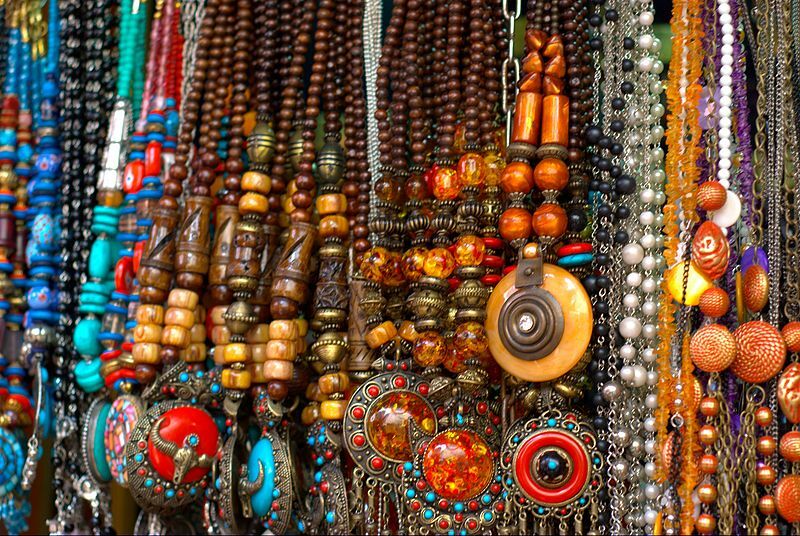 If you think I have missed out any other important street shopping destination in Mumbai, do share it with us. There are areas like Lokhandwala market and Matunga market which are filled with some really good shops, but I decided to include some of my favourites, which are extremely popular. 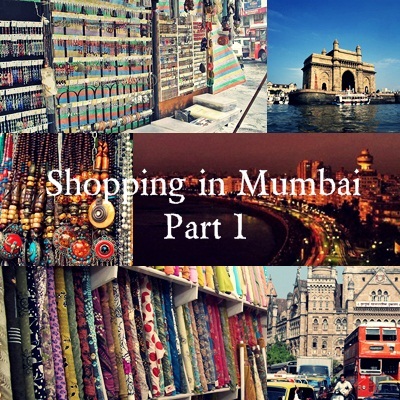 Which is your favourite shopping destinations in Mumbai? Do them share with us. Thats a most-wanted post for every girl who loves to shop. I echo your opinion.Colaba & Dharavi should never be missed.As for Bandra- people rarely miss it as its more hyped than any other place in mumbai! Where in Dharavi exactly? I have been listening a lot of praises about Dharavi bags but donno where to get them in Dharavi. Just get down near the main Dharavi leather market. You can ask any rickshaw or taxi driver for directions. Its the main, busy road from where most of the vehicles move towards Western express highway and Kalanagar. We are well known manufacturer’s and exporters of 100% cotton printed Indian Dress for women.We believe in quality and client satisfaction. Majorly we deal in printed designed cotton dress,cotton sarees, Embrodary dress material and printed bandhni dress material. this season I am going to visit Mumbai....so this info is very usefull 4 me as am wondering where to shop :) thanq ..n well lets how I njoy the trip. Great post! I really enjoyed!!! Which is best time of year to buy sarees in mumbai, i mean when can I get best deals, also suggest some great places offering irresistible deals. Bandra link road ..where exactly..?? I was there near KFC but cudnt find any shops. Straight from KFC (towards National College, opposite stores like Catwalk). The enter stretch is filled with bag, shoes and random apparel stalls on the road. Very informative and succinct article! Any you suggest any particular shops in Dharavi for leather jackets and bags? All this accessories are beautiful, i was in delhi last year and i bought some hearings from sarojini nagar that is best shopping place in delhi for all kind of things, but here in Mumbai i prefer luxury shopping malls for shopping of all branded cloths and accessories. The Monument was worked amid the British Raj in India to stamp the visit of King George V and Queen Mary in 1911. Thanks for sharing this nice Post. It was very useful for us. I have another latest services suggestion information of saree sale in mumbai dadar.